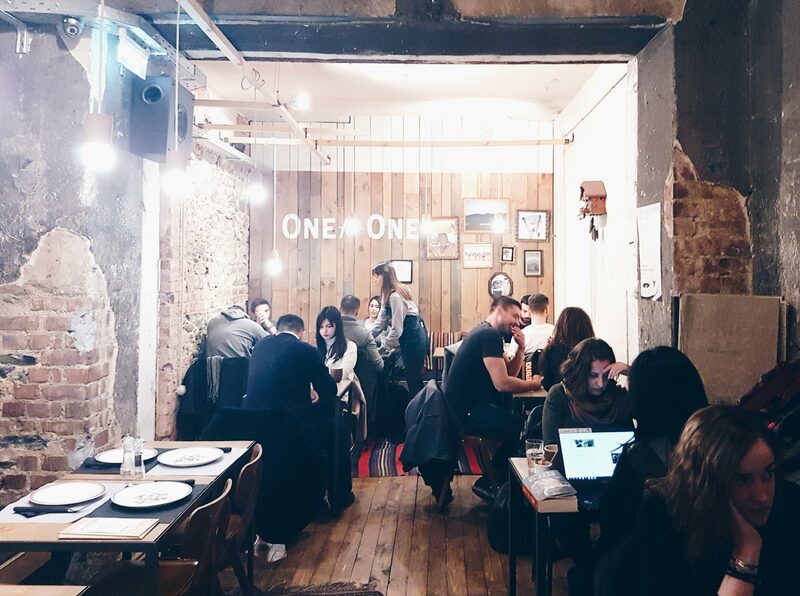 Located right in the heart of the shopping distract of Thessaloniki, on 22 Tsimiski St., TOMS Flagship Thessaloniki offers an alternative hangout spot that combines shopping, philanthropy, eating, and coffee all under one roof. TOMS philosophy is simple: with every pair of shoe bought, the company provides one child in need with shoes. With every finished bag of coffee, they provide 140 liters of clean water to a person in need and with every pair of glasses sold they will restore sight to a person in need. Over the years, TOMS has provided over 60 million pairs of shoes to children, restored eyesight to over 400,000 people, and provided over 335,000 weeks of clean water. In 2015, the company introduced TOMS Bag Collection, which aimed to provide training for skilled birth attendants and to distribute birth kits for safe birth delivers. As of 2016, TOMS helped over 25,000 mothers through their safe birth services. Upon entering this preserved building, Arcade Pelosof, also known as the Old Post Office, you will notice the beauty of this historic property. This building was built in 1924 and originally served as a shopping center. Before the outbreak of WWII, it served as the city’s post office. Then, during the war, it housed the Allie troops. Later, it reopened as a post office until 1978, when an earthquake struck the city leaving unrepairable damage behind. 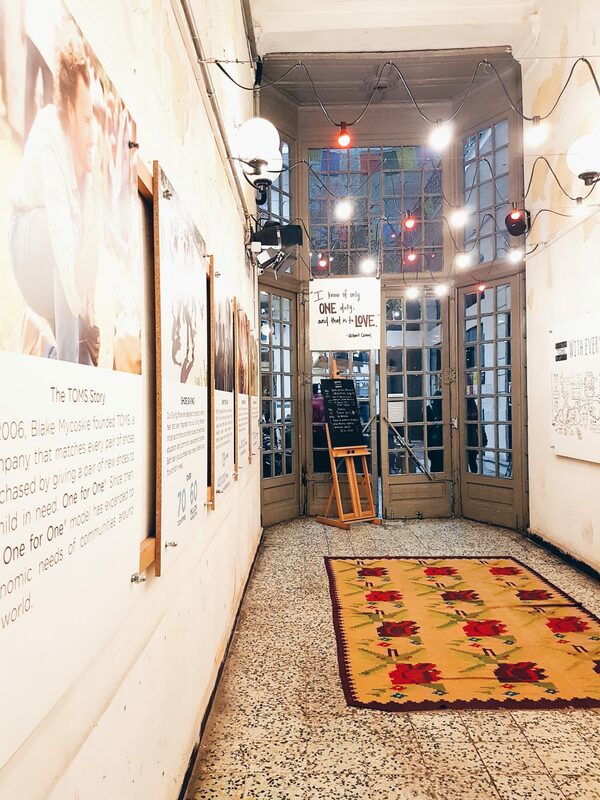 The space was left abandoned for several decades, until the TOMS’ team stumbled upon this historic space and fell in love with it. 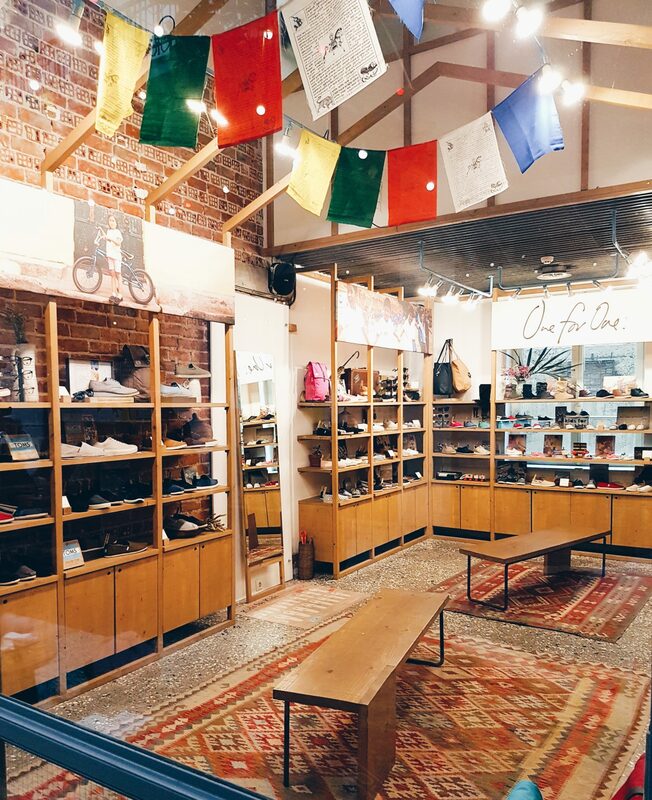 The renovations to turn this historic arcade into a modern store and cafe took about five months. 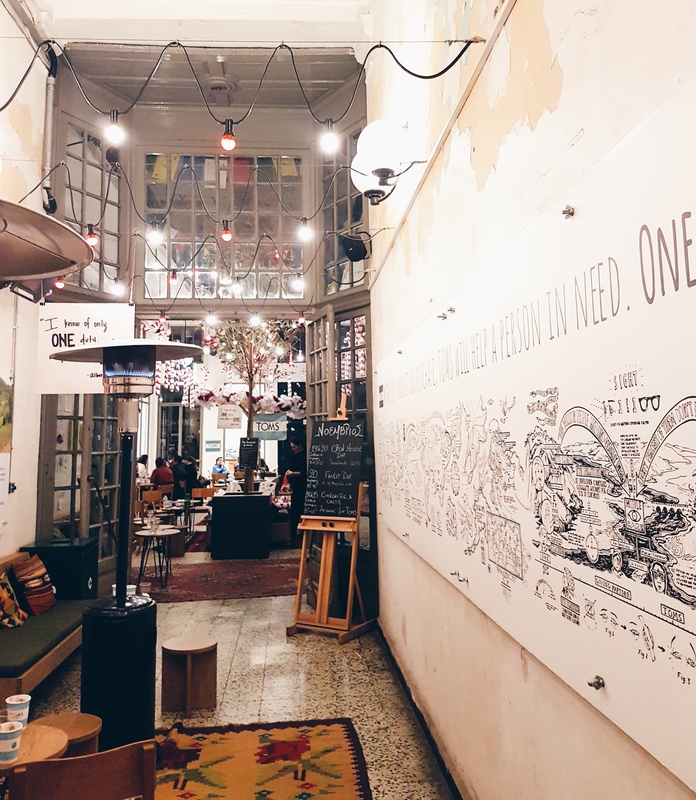 The space was renovated according to the philosophy of the company, that is to re-use and to upcycle, while preserving the significance and history of the old. 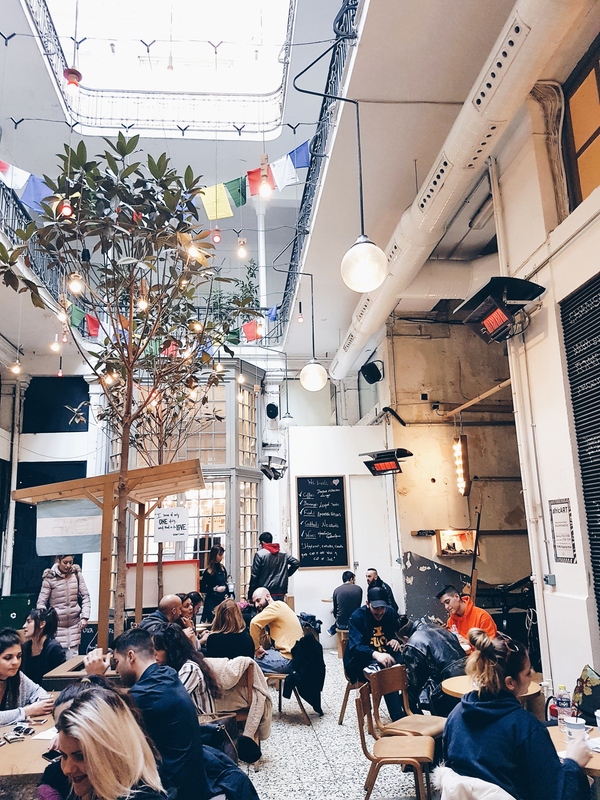 The old floors, walls, doors and windows have all been maintained, while new items such as the metal window frames and the cafe’s furniture have an old vintage vibe to them. 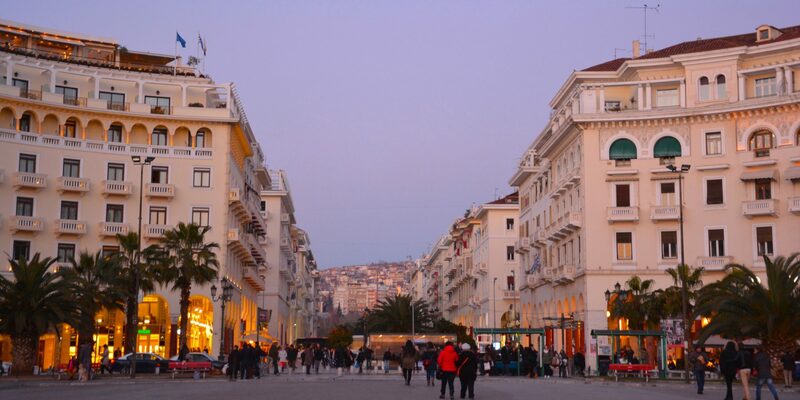 TOMS Flagship Thessaloniki first opened in March 2015. 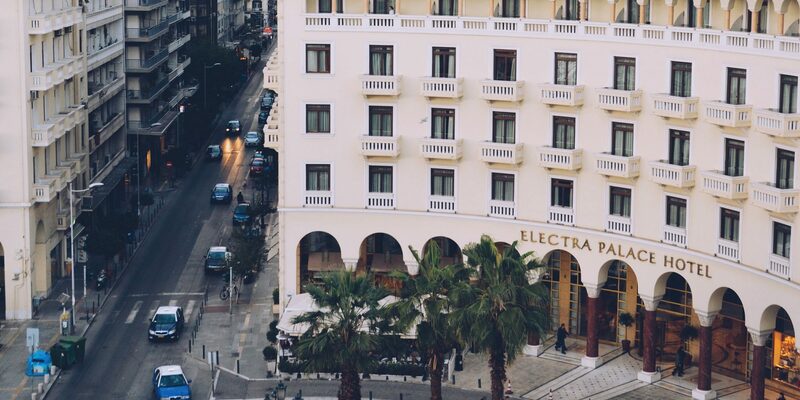 Unlike the other stores on Tsimiski Street, this place is more than just what meets the eyes. 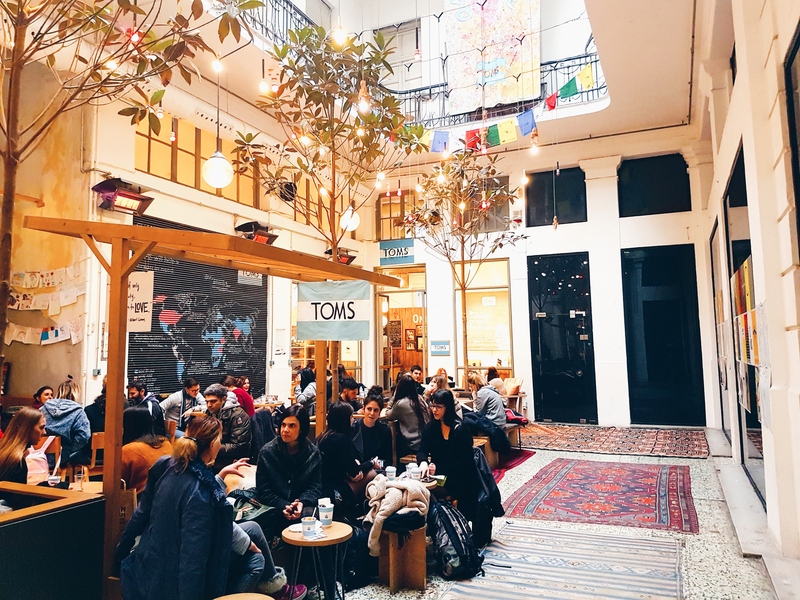 Indeed, TOMS is split into two areas: First we have the TOMS Flagship Store & Café on the ground floor, that sells shoes, handbags, glasses, accessories and of course coffee that is brewed from El Salvador, Ethiopia, Guatemala, and Peru. 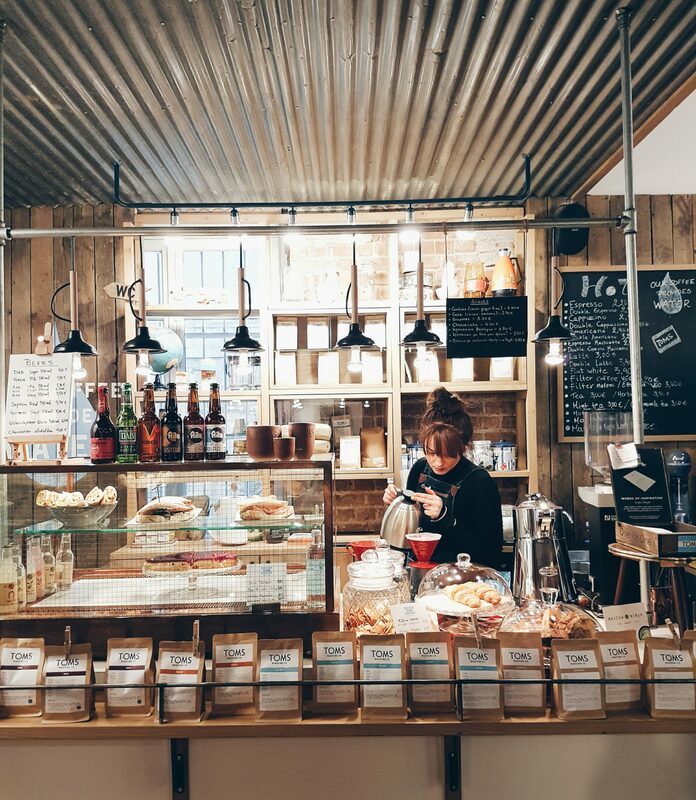 Downstairs in the basement we can find the TOMS House, a cozy and warm atmosphere that serves coffee as well as food. 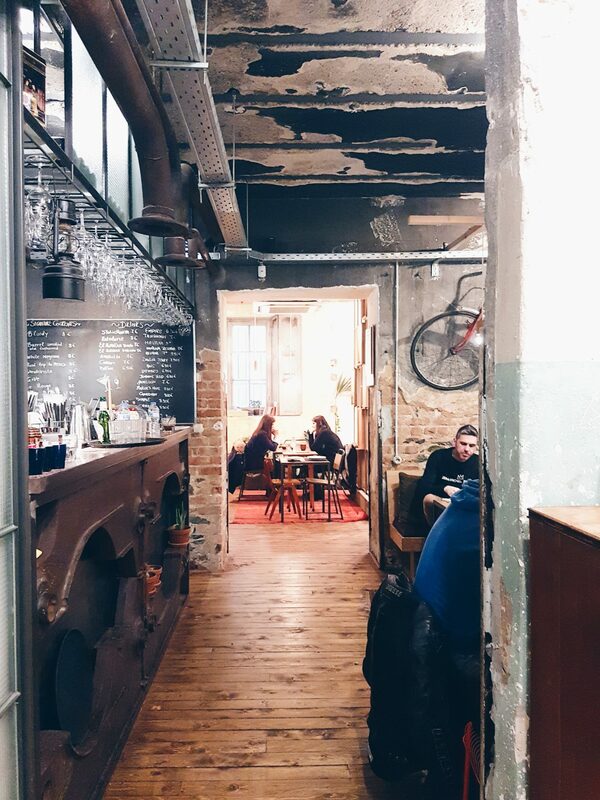 Both the upstairs and the downstairs are ideal settings for casual coffee with friends, business meetings, or just a homelike space to read a book. The upstairs is open with natural light coming through the skylights while the basement is a darker yet cozy environment. On cold days one might even find stray dogs napping in the open arcade – when TOMS say they open their doors to everyone, they literally mean everyone! 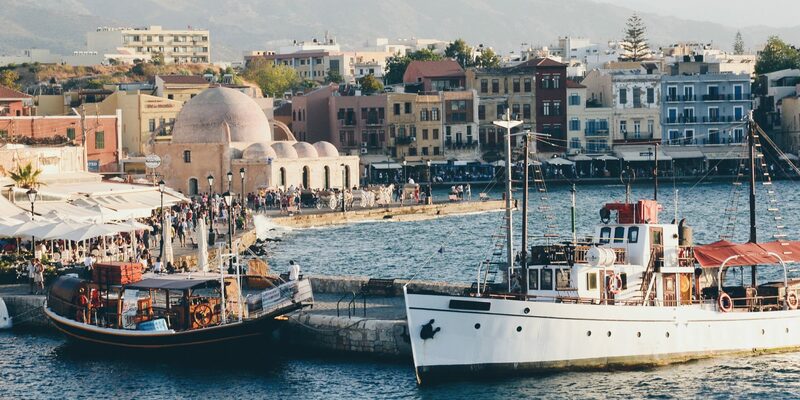 In order to continue the spirit of creating and giving back, TOMS organizes various events that are targeted to kids and adults that include exhibitions, book readings, workshops and concerts. Monthly calendars with the exact dates and description of each event can be found on a card provided with the menu. 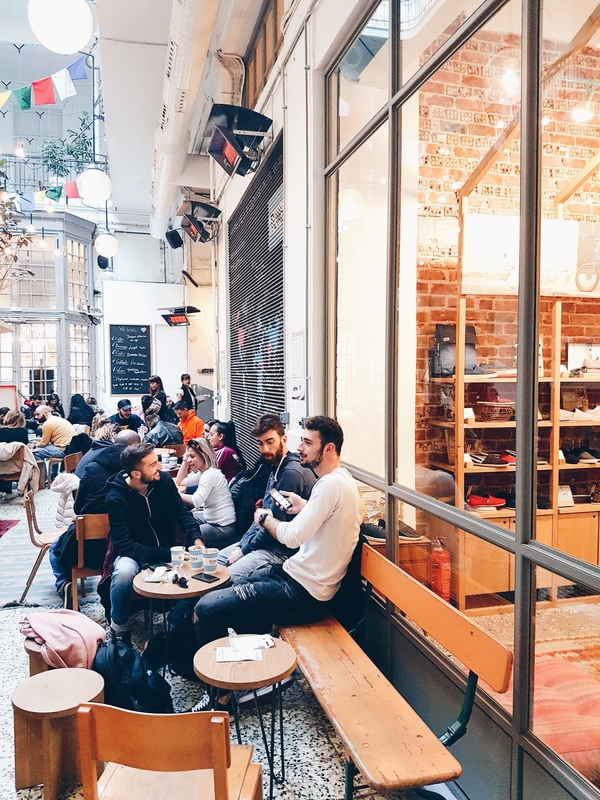 Tucked right in the shopping distract of the city, TOMS Thessaloniki harmonically integrates shopping with coffee in a peaceful and social environment, setting them apart from all the other stores in the area. 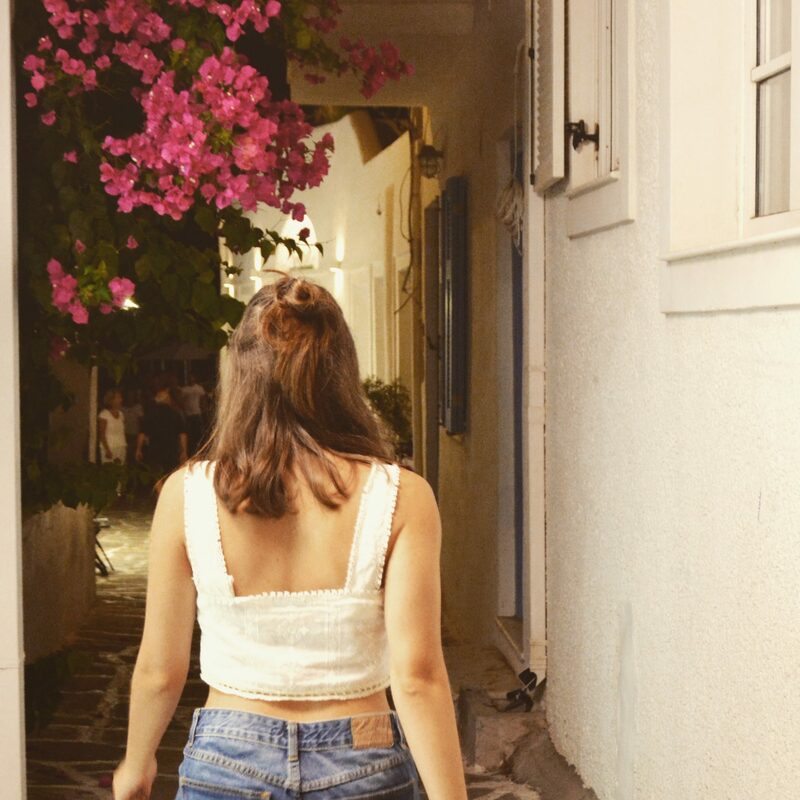 You can read more about secret must-visit spots in Thessaloniki here!